Many people get heartburn after eating, even people who don’t have hiatal hernia pain. But, for people who have a misplaced tummy, the time immediately following a hefty meal can cause heartburn, or GERD (gastroesophageal reflux disease) which can be very painful, especially after meals. 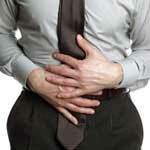 So how do you combat pain and discomfort associated with eating when you have hiatal hernia pain? As with treating a regular hiatal hernia, lifestyle and dietary changes are the best places to start. If you have pain after you eat chicken wings, don’t eat chicken wings – eat cheese fries. If you have pain after eating cheese fries, perhaps a salad? Make wise menu choices when eating, even when eating out, to avoid the heartburn and hiatal hernia pain that can result from poor meal choices. In general, reduction of pain after eating and typical hernia treatment go hand in hand and the dietary choices are very similar. Eating 6 small meals a day instead of 3 large meals with help reduce pain after eating. There are many charts online about which types of foods are best for people with pain after eating caused by a this condition, but the basics remain the same: fruits, vegetables, breads and lean meats will rarely cause heartburn; however, acidic juices like orange and cranberry, French fries, raw onions, alcohol and doughnuts are all no no’s on the hiatus hernia diet. For those of you who are less than perky in the morning, coffee is also a bad idea. If your digestive condition is affecting your ability to eat or you are getting to where you are afraid to eat because you are in pain after doing so, and you have made changes to your diet and lifestyle, then you need to speak to your doctor. You could have a strangulated hiatal hernia. While sharing similar symptoms with the much more common sliding hernia, the strangulated version can lose blood supply and cause a lot of issues. Often these are considered prime candidates for hiatal hernia surgery. With so many risk factors, hiatal hernia causes are plenty, and you may never know where yours came from. However, with proper medical care, and a little effort on your own, you can make changes that will substantially reduce the discomfort associated with the condition, and in many cases avoid medications, even over the counter, entirely.